Graphics In MacVector: Exporting publication quality graphics. This article is the first in a series of “howtos” resulting from the 2010 survey results. 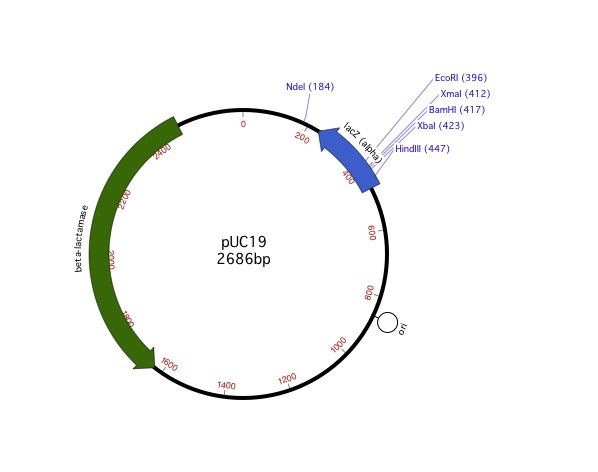 In real terms this means that plasmid maps copied in this way can be resized without any loss of quality and without those jaggy lines. Fonts will remain crisp as well regardless of what size they are displayed at. Whilst at the booth at the ASM2010 recently we thought it was a great example of how good the graphics could be by showing the metre high plasmid map and other graphics on the booth behind us. These were taken directly from MacVector. As a smaller example the map below was also copy and pasted directly from MacVector. Using PDF in this way is the Apple recommended way of dealing with graphics, and it is supported by all the professional applications, such as Adobe Illustrator, Photoshop etc. In addition the FILE > EXPORT menu will allow you to directly save the MAP view to a PDF file, and if you require a format other than PDF, then you can save a plasmid map in any OS X supported graphics format by utilising PREVIEW. This is an often underlooked utility found in the Applications folder on all Macs. It’s an incredibly useful tool for graphical data as it supports so many formats. – Open PREVIEW and select FILE > NEW FROM CLIPBOARD. Once you’ve done this you can save the file as a PNG, JPG or any supported file. – Resize the map to the size you require. – Open FILE – SAVE AS. – Change the file type to TIFF, and change the DPI to the required value. In the next post we’ll discuss how to customise the actual graphics. This entry was posted in General, Techniques and tagged graphics. Bookmark the permalink. Both comments and trackbacks are currently closed.